Set off on the adventure of a lifetime on the iconic Trans-Siberian Railway. 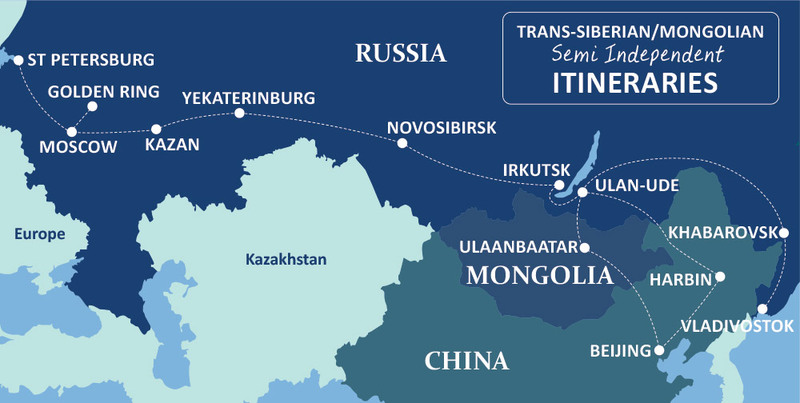 Our private semi-independent rail train itineraries are organised on premium overnight trains along the trans-Siberian and trans-Mongolian railway with stops in major cities along the way. You will stay in great central hotels and have our best guides take you on exciting city tours. These are not group tours; this is your own private itinerary and we will take care of all the arrangements so you can focus on enjoying the adventure! 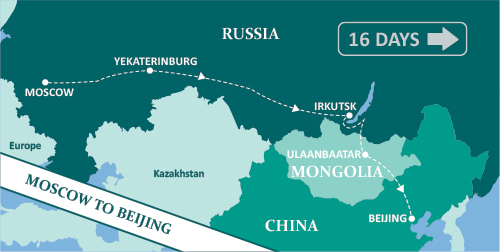 We encourage you to choose from one of our base itineraries listed below then opt for either an “essentials” or ‘inclusive” programme of stopover activities. Essentials – If you are the type of traveller that likes plenty of free time to do your own thing then “essentials” is a great option for you. Inclusive – If you prefer all the highlight experiences are included, and everything is taken care of then “inclusive” is the way to go. We also offer an exciting range of trip extensions that can be added to customise your journey with longer stopovers or extra cities. So depending on your own timescale and budget we have a trip to suit. And of course, all of this comes with our commitment to quality and attention to every detail; including the option of a complete, ‘done for you’ visa service.